It’s hard to believe that one week ago I was on a plane en route from Paris. My time in Italy and Paris was…magnificent. The sun shone, the gardens bloomed, the croissants were extra warm and flaky, and the pasta was perfectly al dente. Have you ever had a trip that went so smoothly, it was as if the entire universe conspired to ensure you had a nice time? That was my 10 days in Italy and France. Giverny: Monet’s home and gardens, where he completed his famous waterlily paintings. Although the return to reality often incites a case of the post-vacation blues, lucky gal that I am, I was able to push it off for one final, magical day. 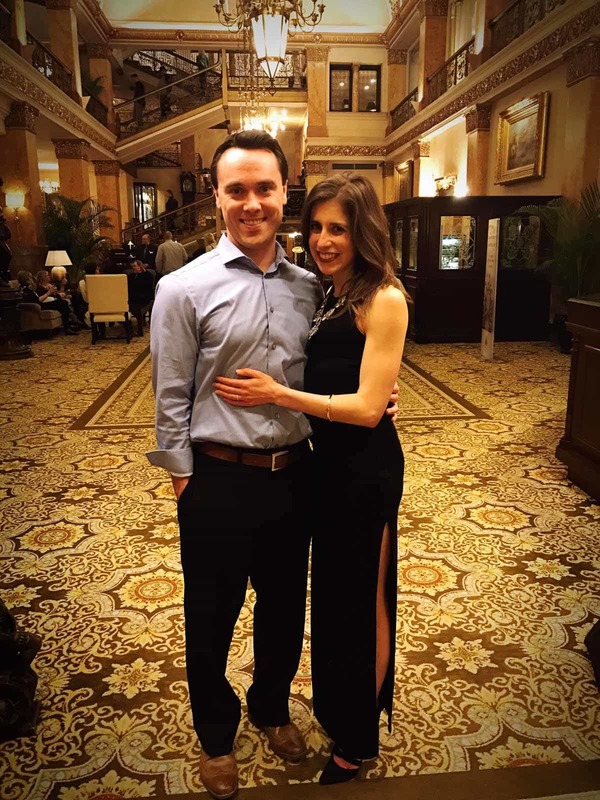 My first day back was also Ben and my five-year wedding anniversary, and we had the pleasure to spend it at The Pfister Hotel, a gorgeous historic hotel in downtown Milwaukee. In addition to its beautiful architecture, superior service, and the most comfortable hotel bed I’ve ever slept on in my life, the Pfister offers an array of excellent dining options. We had one of the best dinners I’ve eaten in Milwaukee (or any city really) at Mason Street Grill. The food alone would have made the experience memorable, but it was the service that made the evening one that we’ll never forget. The restaurant poured us a surprise glass of their best wine to help celebrate and even made us a dessert plate that had “Happy 5th Anniversary” written in chocolate along its edge. I seriously felt like a celebrity. The lobby at The Pfister Hotel. And because you asked on Instagram, I found my dress here. The necklace was a gift from my sisters, originally purchased here. Although Ben and I make a point to have “date night” at least once a week when we are in town, our evening at the Pfister and Mason Street Grill was truly something special. If you are anywhere near Milwaukee and can swing a night and/or a meal here, I can’t recommend it enough. On our agenda for this weekend is a delayed dose of reality (confession: I still haven’t done laundry since arriving home!) and maybe a trip to Chicago if Notre Dame hockey makes it to the national championship. Well, Ben is going for the hockey. I’m going for time with a few girlfriends and, weather permitting, a run through Millennium Park. Here are a few fun finds from the past few weeks, and a few of your Instagram photos too. Any favorites of your own? I’d love to hear about them! Most popular recipe on my site right now: Crock Pot Low Carb Lasagna, which now includes a video! Upcoming blog recipe I’m most excited to share: Lentil Meatballs. So simple and SO GOOD. On this week’s dinner menu: Grilled Citrus Tuna with Avocado and Spinach. Can you say SUPER FOODS? Restored my faith in humanity: I accidentally left my Kindle in a wine bar the night before I left Paris and assumed I would never see it again. Lo and behold, an American I met that night picked it up, Facebook messaged me for my address, and is mailing it back to me! Reading: The Paris Wife (as soon as I get my Kindle back; see point above). In Paris, I stayed in the same neighborhood where the novel takes place and walked past many of the cafes mentioned in the book, so it truly brought the story to life. Surprise gift from Ben: This daily journal. Each page has one date with spaces for five years of short entries. The idea is to write a little blurb every day, then repeat five years in a row. I love that the space is small, so you don’t feel pressured to jot down more than a thought or two, and it’s designed to make it impossible not to look back on prior years’ entries. I’ve struggled to consistently keep a daily journal for years, and I think this is finally going to help me stick with it. Obsessed with: The smell of this candle. I loved it so much, I bought the matching hand soap to keep in our kitchen. Renewed my subscription to: Martha Stewart Living. I subscribed to more cooking magazines than I had time to read last year, and of my current stack, Martha is the only one I’m keeping. Even though I am not a DIY-er at all, I always finish the magazine feeling inspired and take away a fresh recipe idea or two. Wondering if: Lamps like this one are legit. It’s been gray, cold, and rainy here for the past week, and I’m thisclose to making an impulse buy to see if it lifts my mood. Looking for recommendations: For budget-friendly home decorating blogs. We’ve lived in our house 2.5 years and I have yet to purchase a single curtain or hang pictures in the guest bedroom. I find home design a bit paralyzing and would love some inspiration. INSTAGRAM: Here are a few photos of Well Plated recipes you’ve made and posted. This absolutely makes my day! If you make one of my recipes, I’d love to see it on Instagram and might feature it here! Just snap a photo and tag it #WellPlated, and I will be sure to find it. I absolutely love to know what you’re cooking. Don’t you two look nice! The picture of the gardens is just breathtaking…must have been a beautiful place to visit. And the Phister is one of the all time most beautiful hotels ever…been around a LONG time and still so gorgeous. Chris, the Pfister must get more stunning with age, because it is GORGEOUS! 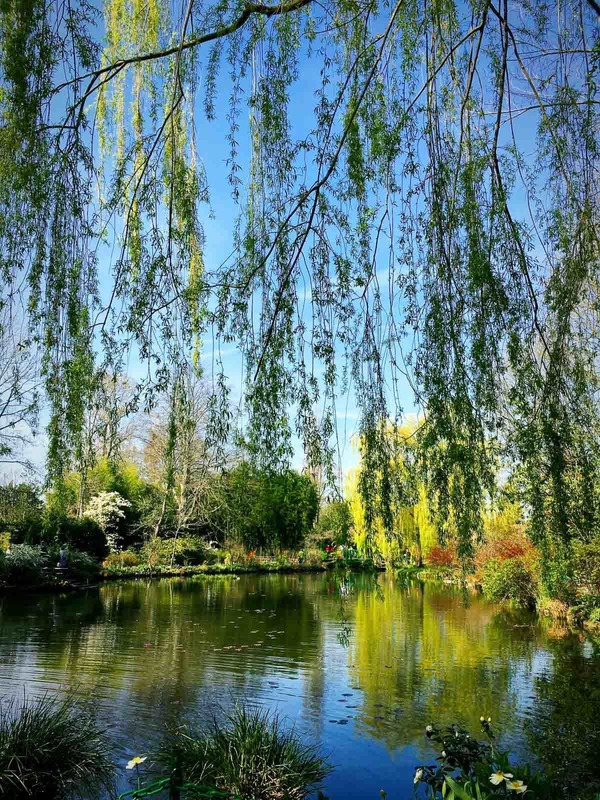 Giverny was lovely too. Thank you so much for leaving this kind note! Really enjoy your blog- keep up the good work. What a beautiful date night! I have a hard time getting my fiance to dress up. I love your dress too. Hope you have a great weekend. Hi Erin – Beautiful pictures. People are nice, glad you got your Kindle back! And the lamp, I have that exact one and they are legit! Got me through a lot of dark stormy days back when I lived in Illinois. Try it, they really do work. For home decor inspiration, visit the blog above! I’m glad to know I’m not alone, Elisabeth! We’ll see how it goes!